The Whirlpool Lab Refrigerator Freezer provides flexible, everyday sample storage, housed in sturdy construction. This 18.1 cu ft capacity cold lab storage unit has up to 23 sq ft of shelf area, split between a 13.1 cu ft Refrigerator area and 5 cu ft of freezer space. This freezer refrigerator combo features magnetic gaskets for sure closing, durasheild lined interiors and doors, with urethane insulation, and adjustable shelving. This lab Refrigerator and freezer has an easy access, up front thermostat, with adjustable shelving and clear drawers to help locate items quickly. The doors of this lab Refrigerator freezer combo unit are reversible, and the unit only requires 1” clearance around the exterior. It should be noted, this unit is intended for use in a lab environment only and not for use storing food or items consumed by humans. 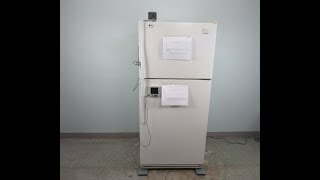 This GE Wirlpool Refrigerator/Freezer Combo has been fully inspected and reached it's temperatures without issue. All of our lab equipment comes backed with our standard warranty. Should you have any questions, please don't hesitate to contact us.